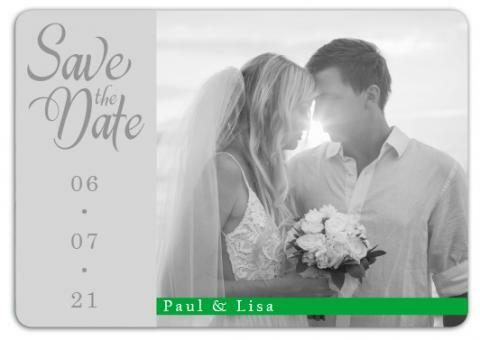 Personalized 3.5 x 5 inch green stripe floral ornament wedding save the date square corner magnets are being favored by couples who love traditional weddings. As floral patterns are heavily utilized during wedding ceremonies in east and west, so they have become integral part of a wedding ceremony. Floral patterns are conceived as symbol of austerity and they are largely inducted in decorations and trousseau. Custom 3.5 x 5 inch green stripe floral ornament wedding save the date magnet will remind a viewer about your special day. It often becomes a great memoir of a wedding event and an interesting refrigerator art. Product Size: 5 in. x 3.5 in.